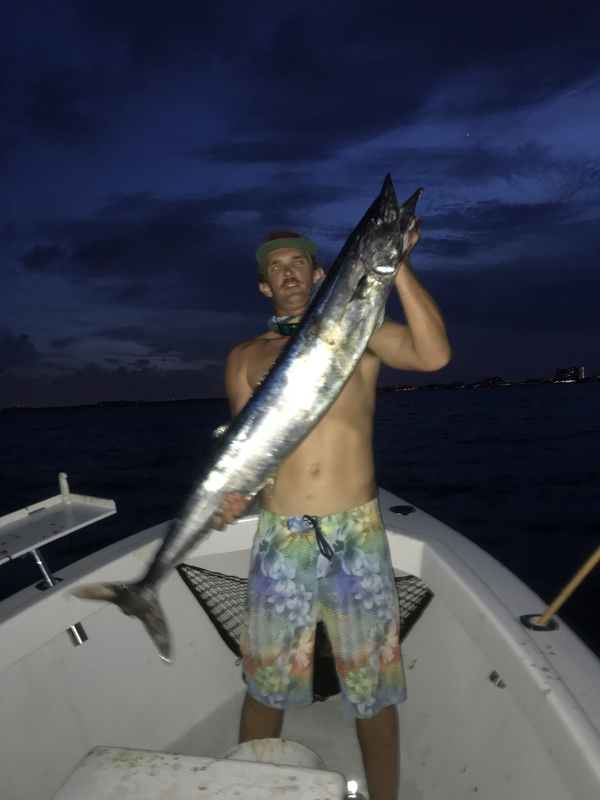 Buddy calls me yesterday mornin and asked if I could swing a late afternoon wahoo troll after work. Affirmative. We dip his 20 footer in about 5pm and before long we are set up outa boca trolling the reef north. 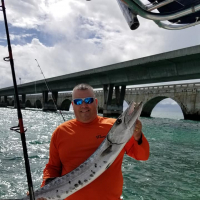 We begin seeing a lot of bait and some kings airing out so we troll through.no bites except a medium Bonita. We make a good ways north and then whip it back south to troll home to boca. The suns gettin low along with the boats morale, but I knew all we needed was one bite. One fish to turn the trip around. One of my buddies makes a comment about how dark it’s gettin hinting to me to stop dreaming and wrap it up. “One more pass” I beg. I got my way! one more out to what I think is about 200’ (no gps) and I’m swinging back toward boca. I don’t make it to my desired turnaround depth before the tiagra starts singing the wahoo song. Dumps a little line before we get him turned and making way to the transom. A swift hand line job and a clean gaff shot and we are lookin at a fat boca striper on the deck ! Moons out hoos out! Perseverance pays off! Nice catch! I thought it was snook's out, balls out, nice work cody! Nice work! I trolled some strips on planers on Friday morning from Boca to Boynton with no luck! Congrats on the 'hoo! The 5 minute warning works again! I love making that call and messing it up with a Fish On! Were you guys high speed trolling or meat fishing? 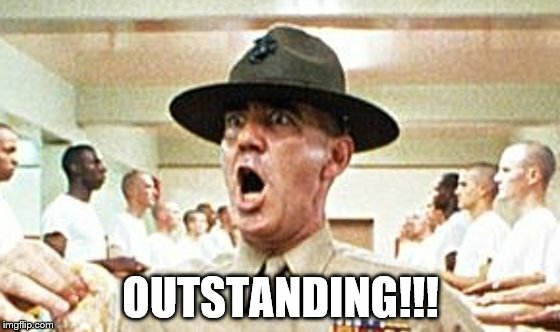 Well done, nice story -- Congrats !